Image by Laughing Squid via FlickrWhether its Prince William’s new look (with a beard) or President-Elect Obama’s inability to grow facial hair, politics and beards have been in the news lately. One example is in “The politics of beards” by Knute Berger. When it comes to facial hair, what type of impression do you think it gives in the world of politics? 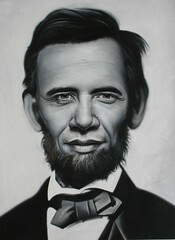 President-Elect Obama professes an admiration of bearded president, Abraham Lincoln (with whom some compare him). If President-elect Obama could grow facial hair, do you think it would ruin his credibility – or do you think the fervor surrounding him would enable him to ‘get a pass’ on any negatives associated with facial hair? Does facial hair make any difference to you in the world of politics? To some in the UK it does. To see a picture of the Prince with his beard and read an article questioning his ‘suitability to be king’ because of it, check out this article (with comments) in the Telegraph.